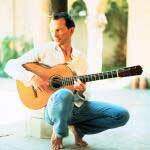 If you're a regular reader you know I love Ottmar Liebert. His music is amazing, and he's a savvy guy who understands that you can't put the technology genie back in the bottle, so you'd better embrace it instead. He and his team recently posted a new listening lounge, which is the exact way an artist should present themselves online, IMHO. You can download free tracks, purchase tracks for $1 each (no DRM) in a variety of formats, browse through the music by tags, and explore other artists' work. And everything is released with a Creative Commons license. If you like Ottmar, you'll love the lounge, and if you're not familiar with him this is your chance to become acquainted!